Facials for Sensitive Skin - The Groundbreaking New Treatment! One cant help but notice that 2 of the most popular ingredients for facial and body treatments these days are Collagen and Hyaluronic Acid. While they truly are miracle products that can improve skin moisture and help reverse aging, they can also be harsh for certain skin types, especially men. Unlike women, the majority of men take a sharp (or worse, dull!) blade to their face on a daily basis to shave. This process, done day in and day out for years on end, has a major impact on already delicate facial skin, causing it to become hyper-sensitive and easily inflamed. 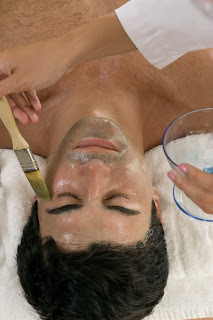 As a result, men typically need significantly gentler treatments so as to restore their skin. Rather than collagen or hyaluronic acid, consider using a Ceramide Transdermal Mask on your clients with extra-sensitive skin. Formulated with Shea Butter, Olive Oil, Avocado Oil, Sweet Almond Oil, Jojoba Oil and Lavender Oil, this mask packs a major punch against dry and blotchy skin. Even though it is filled with a variety of oils, they are non-comedogenic and will not clog your clients' pores. It smells fantastic, feels soothing and helps repair broken capillaries in the skin! Lastly, each pack contains 6 masks, making them only $6.58 each for high quality ingredients - Effective on skin and cost effective on your wallet. What other types of treatments do you like to provide for your clients with Sensitive Skin?